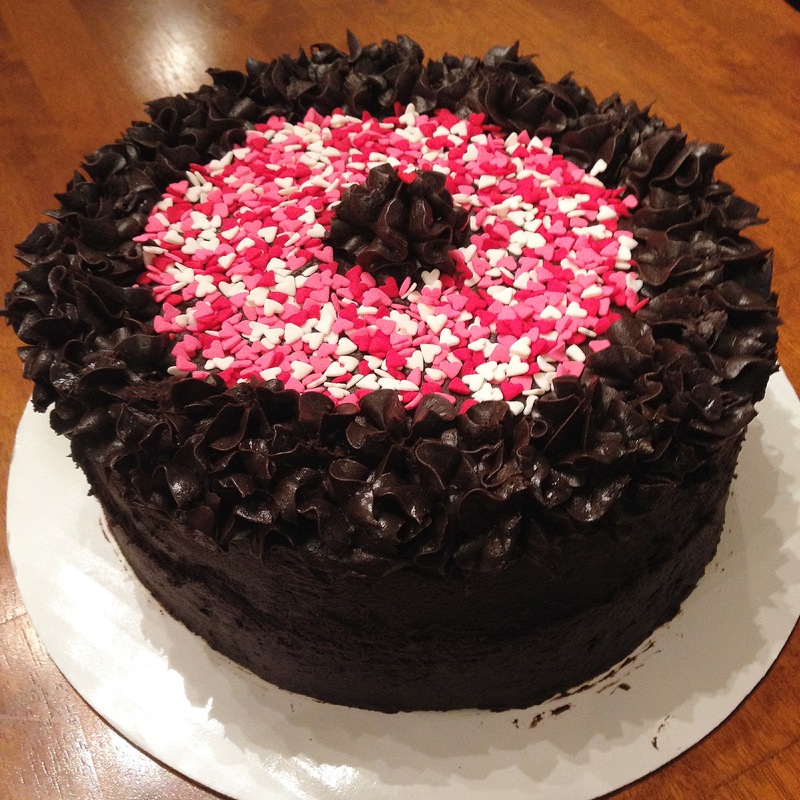 Obviously, I made this cake for Valentine’s Day. I asked my wife what kind of cake she wanted, and she said “chocolate, chocolate, chocolate.” So, I obliged, but only after trying to incorporate a non-chocolate element, which she poo-pooed. This is a chocolate layer cake with chocolate ganache filling and chocolate cream cheese frosting. The cake is awesome. 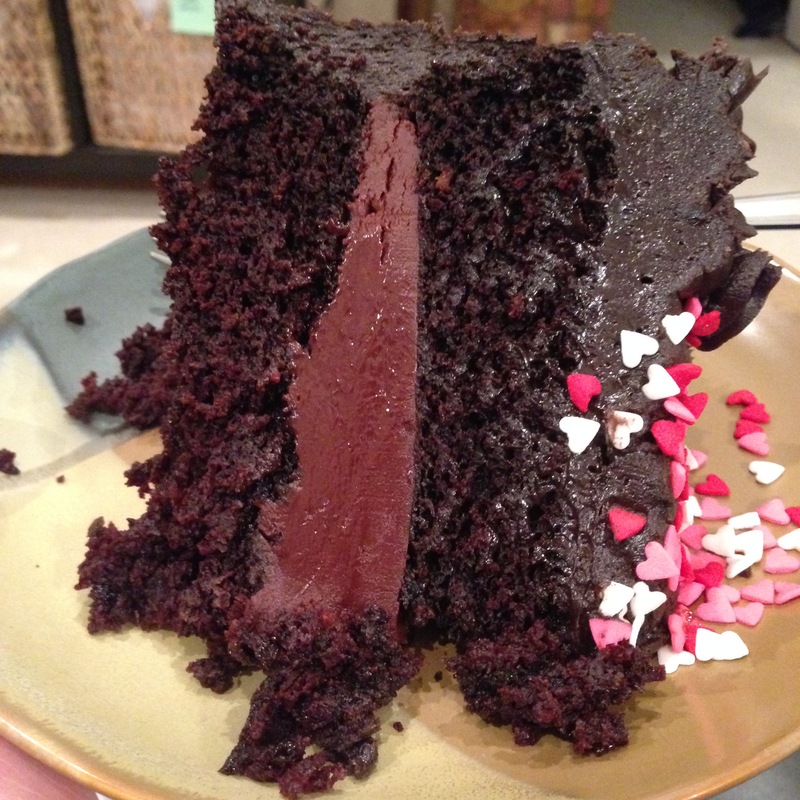 It is the best chocolate cake recipe that I have tried to date. It’s the exact consistency for which I’ve been searching: moist, kind of dense but still kind of light. I got a little nervous during the preparation process because it seemed like I had too much batter for regular 8″ x 2″ cake pans and a reader comment mentioned that her cake baked over the pans. I used 9″ x 2″ pans instead, resulting in thinner layers than I had wanted. The 8″ pans might have worked after all, though, and next time, I’ll use the 8″ x 3″ aluminum pans that I’ve been eyeing. Honestly, the ganache filling was disappointing. Not only did I use too much of it, it just wasn’t that good. It’s not like you can go wrong with more chocolate, but this was on the very edge of rightness. I had wanted to use a raspberry buttercream frosting in between layers (this one), and I have a feeling this would have been better than the ganache. I’m including the recipe I used (maybe I should have whipped it into frosting), but if I’m making this cake again, I’m either using the chocolate cream cheese frosting or going raspberry buttercream instead. The chocolate cream cheese frosting was amazing. I actually ate a second piece of cake specifically to gorge myself on more of this frosting. Unbelievable. I never would have thought to add chocolate to a cream cheese frosting recipe, but I’m glad I stumbled upon the recipe. It’s a keeper. I got a little fancier than normal with the decorating for the first time, which worked out quite well because I was able to apply more of the extraordinary frosting! For the cake: Preheat oven to 350 degrees. Butter and flour two 9″ cake pans, line with parchment/wax paper, then butter and flour the parchment/wax paper. Whisk flour, cocoa powder, baking powder, baking soda, and salt in a large bowl. Set aside. In a medium saucepan over medium-high heat, combine water and sugar. Bring to a boil, and stir until sugar dissolves (about one minute). Remove saucepan from heat, add chopped chocolate and butter, stirring occasionally, until melted. Whisk in vegetable oil and vanilla extract. In a separate bowl, beat the eggs. Temper the eggs with some of the warm chocolate mixture and then add in the tempered eggs (or wait until chocolate mixture is cool enough). Divide the batter between the two cake pans (I had about 740 g in each pan). Bake for 25-30 minutes or until cake tester comes out clean. Let cakes cool in pans until cool to the touch, then carefully invert onto a wire rack lined with parchment/wax paper (cakes are very soft and moist). Carefully remove parchment/wax paper from bottoms of cakes. For the ganache: Add heavy cream and butter to a small saucepan over low heat until the butter is melted and the cream is warmed throughout. Add chocolate chips to a glass bowl. Pour warmed cream over the chocolate chips, add in coffee and salt. Let stand 3-5 minutes to soften chocolate chips completely. Stir to combine (if cream is not warm enough, you might have to place chocolate back into the saucepan and warm over low heat to achieve smooth consistency). Allow to cool completely, then layer on top of the bottom cake layer. For the frosting: Using a stand mixer, mix cream cheese and butter on medium-high speed until smooth and creamy. Mix in cocoa powder, then frost the cakes.